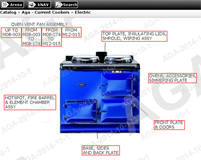 If you already know the part catalogue number then please enter the number below to search our shop. 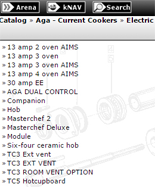 Follow the link to the Aga Rayburn online catalogue to begin finding your part. Once you have opened the parts catalogue follow the simple steps below. stove/cooker type. For example gas, electric, general, oil or similar. 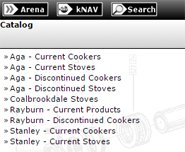 You will then be asked to select your stove/cooker model from the list provided. Use the photograph/diagram to identify the area where the spare is required. 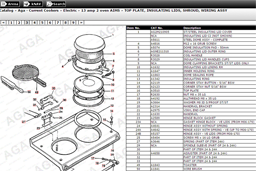 There will be diagrams to help you identify the exact part you require. You must make a note or copy the catalogue number code. Search our online shop using the catalogue number.